Kastro Beach Hotel is a friendly family-owned complex of apartments and studios in Malia, on the gorgeous island of Crete. Located very close to the sea, on the attractive beach road with its bars, restaurants and shops the 3-star Kastro Beach Hotel has a relaxed atmosphere with recently remodeled rooms, which are all equipped for a self-catering holiday and is perfect for young couples and groups. There is a swimming pool and sun terrace on which you can relax and unwind. 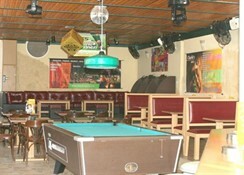 Charlie's Bar is the place to socialize, eat and watch live sports and satellite TV. Kastro Beach Hotel is the ideal for young, dynamic travellers - singles, couples and groups alike - who seek the ultimate sun-filled summer vacation. Its location its perfect if you want to explore Crete's beautiful beaches, archaeological sites and historical islands like Spinalonga. Book Kastro Beach Hotel to enjoy Crete, have fun on the beach and in the nearby town and be kind to your budget. 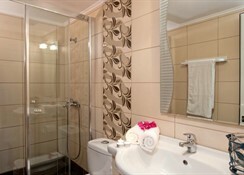 Getting to the hotel: Heraklion International Airport is 33 km from the Kastro Beach Hotel. Local tips: The complex is 1 minute from the beach and a short stroll to many restaurants, bars, clubs and shops. The old town of Malia with traditional taverns and cafes is only a 10 minute walk. Please Note: Due to the location and layout of this property it is not suitable for guests with wheelchairs as there are no ramps. 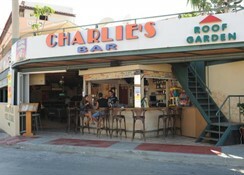 Food, drink and entertainment: Charlie's Bar offers breakfast, lunch & dinner, cocktails etc. 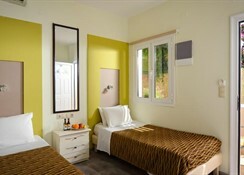 and has live screen sports, movies and games available, and there is a pool bar which also offers snacks and drinks. 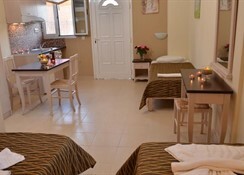 Sport, games and activities: Swimming pool, sun terrace with loungers & parasols. Pool table (extra charge),Beach access with external water fun/sports available. Additional: Reception Services from 07:00 till midnight - guests arriving outside these times should provide arrival time in 'Special Requests' to ensure staff are on hand to check them in on arrival, free Wi-Fi in public areas, internet corner (extra charge), security guard at night. Due to the location and layout of this property it is not suitable for guests with wheelchairs as there are no ramps. Please collect your keys from reception. Reception Services from 07:00 till midnight - guests arriving outside these times should provide arrival time in 'Special Requests' to ensure staff are on hand to check them in on arrival.